The TDA1565TH is a monolithic power Amplifier in a 20-lead heatsink small outline plastic package. 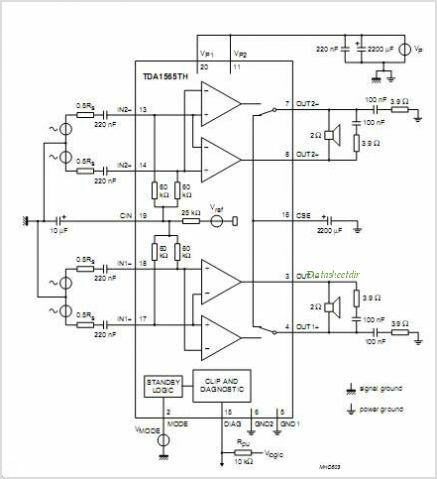 It contains two identical 40 W Amplifiers Power dissipation is minimized by switching from SE to BTL mode only when a higher output voltage swing is needed. The device is developed primarily for car Radio applications. This is one package pinout of TDA1565TH,If you need more pinouts please download TDA1565TH's pdf datasheet. 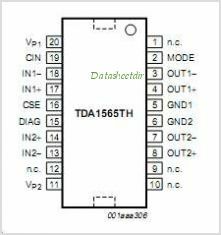 This is one application circuit of TDA1565TH,If you need more circuits,please download TDA1565TH's pdf datasheet.